The stopping place for Rede Expressos, Renex and Expresso Qualidade (EvaTransportes) and other long distance services has transferred to the new remote facility in Rua da Abicada. Services to and from Seville operated by both ALSA and EVA / DAMAS also now stop there. Map here. Other relevant information is here including the 'shuttle' every 45 minutes between the new bus station and the Avenida Guanaré. ON VAI E VEM BUSES SUMMER TIMES APPLY ONLY DURING JULY AND AUGUST. Make sure you are looking at the correct times. GENERAL INFORMATION ABOUT PORTIMÃO CITY TRANSPORT - PLEASE READ! Portimão is linked with the rest of the Algarve by the inter-urban and express bus routes listed above. The railway station is just to the north of the city centre, with trains along the Algarve route and connections with Lisbon via Tunes. Long-distance buses (coaches to UK readers) run to Lisbon and more distant parts including Seville. 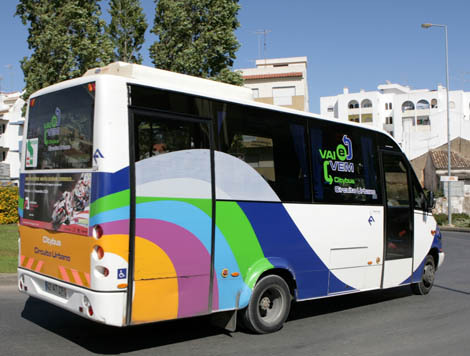 The city of Portimão and its suburbs are served by a network of mini-bus routes under the banner ‘Vai e Vem’. Service starts at 0700 and finishes between 1930 and 2000hrs. On December 24th service ends at around 1900hrs. In summer there are later buses between Portimão and Praia da Rocha but not elsewhere. At weekends and public holidays some routes have very limited service, several have none at all, The mini-buses used for most journeys are grossly inadequate at busy periods (school start and finish times) so be prepared for overcrowding and even for a full-up bus sailing past your stop. The picture below is one of the minibuses used most of the time. They do have some larger buses used at busy times on some routes. These buses do not go across the river to Ferragudo etc! There are maps and timetables at some city centre bus stops, but many other stops have no information at all. The links below are to the official timetables. Timetables are annotated in Portuguese and English. The official website itself, only in Portuguese, is here. THE OFFICIAL SYSTEM ROUTE MAP IS HERE. All stopping places are shown. 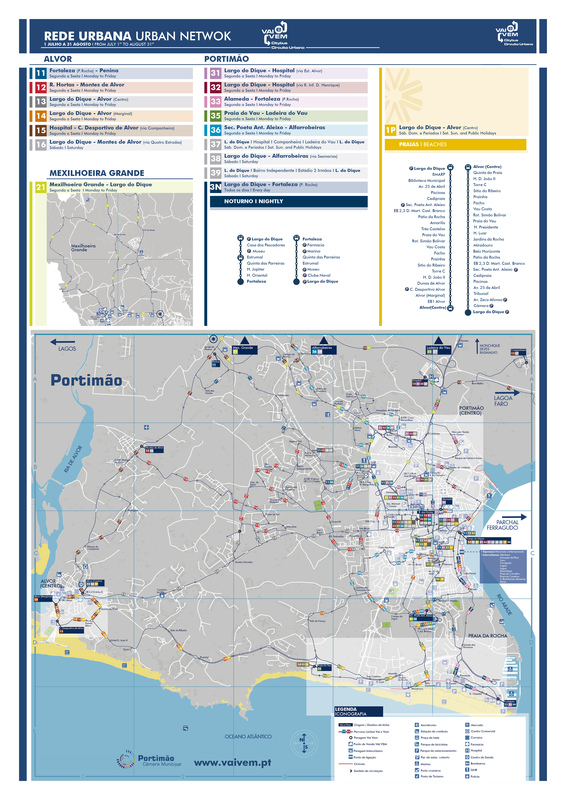 All the links below are to the official maps and timetables on the Portimão council website and will open in a new window. Most routes serve the Largo do Dique in the City Centre. The Alameda is the large square in the older part of the city about 5 minutes walk from Largo do Dique. Some routes start/end at Rua das Hortas rather than the Alameda or Largo do Dique. Rua das Hortas is near the municipal market and quite a walk (about 750 metres) from the Largo do Dique. Inbound buses that stop at the Centro de Saúde (Health Centre) stop at the city market outbound. The Health Centre is a short walk from the market. See the map. In Praia da Rocha, inbound buses stop at the Hotel Jupiter, Hotel Oriental and the Fortaleza. They return via a parallel street without stopping. The route between Portimão city centre and Praia da Rocha has late evening service in July and August. This is now the only route operating after about 2000hrs. In ALVOR all buses in all directions call at the bus stop at the large roundabout junction at the entrance to the village. At the time of my last visit no current timetables were on display. There is a local agent selling Vai e Vem bus passes called Papelaria d'el Rei nearby at Rua Marquês de Pombal, nº 3. Open every day. CRUISE LINER SHUTTLE - the port of Portimão operates shuttle buses as required between the cruise dock and the city centre at Largo do Dique. The distance is about 1 mile / 1.6km and is easily walkable. The main routes of interest to visitors will be these. You can download the official timetable and route diagram to your device from this page. At the time of my most recent visit, no current timetables were visible at the main Largo Do Dique bus stops nor at Alvor. Many bus stops do not indicate which bus stops there, some are still carrying the numbers for routes discontinued 2 or 3 years ago! 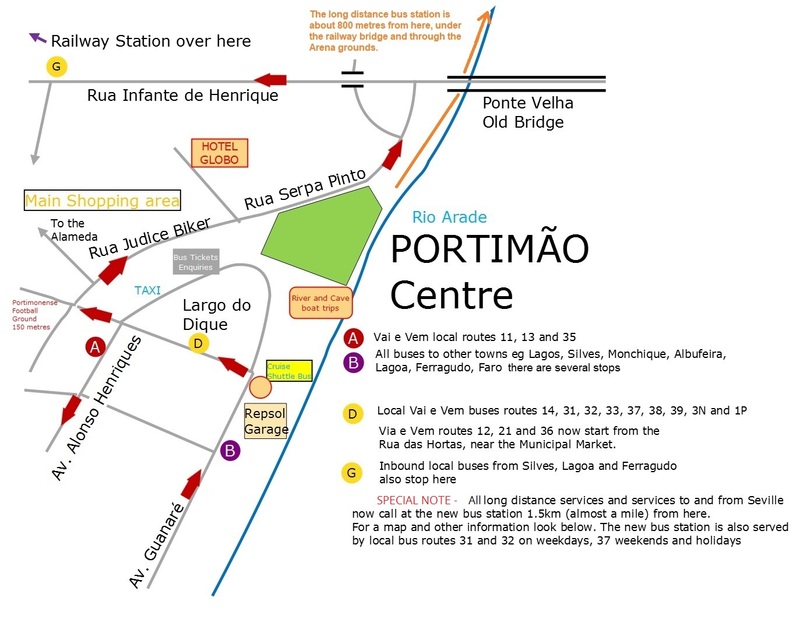 Route 14 City Centre (Largo do Dique) - Alameda - Portimonense Stadium (outbound only) - Poeta Ant.Meixo School - Vale França - Praia do Vau - Clube Prainha - Torralta (Dom Jõao II Hotel) - Alvor Praia (beach) - Alvor Centro. Runs via Alvor Praia in this direction only. To go from there to Praia do Vau etc take the inbound bus and go via Alvor Centro (Roundabout) runs every 30 minutes on weekdays only. For weekend and holiday service see route 1P below. OTHER WEEKDAY ROUTES - these DO NOT RUN AT WEEKENDS OR ON PUBLIC HOLIDAYS. Parque de Feiras e Expo* and Portimão Arena. The next stop is Rua Abicada, outside the new long distance bus station. Route 12 - City (Rua das Hortas) - Bemposta - Montes do Alvor (near the aerodrome) every 30 - 45 minutes during peak hours, every 90 minutes otherwise. Route 13 - City (Largo do Dique) - Tres Bicos - Bemposta - Hospital Particular - Alvor Roundabout every 25 minutes during peak hours, every 50 minutes mid-morning and mid-afternoon. This bus starts from a different stop at Largo do Dique than the other buses to Alvor - check the map or you might miss it like I nearly did! See Route 16 below for limited Saturday service along this route. Route 15 - Campanheira - Hospital - Penina - Montes de Alvor - Alvor Roundabout - Alvor Praia (beach) runs eight times a day at irregular intervals; Campanheira is served only at peak hours in winter. Route 21 - Sargoçal - Mexilhoeira Grande - Rotunda Autodromo - Montes da Cima - Alcalar - Hospital - City (Rua das Hortas). Four journeys each way plus schooltime journeys. A rather complicated timetable to understand! Route 32 - CIRCULAR ROUTE City (Largo do Dique) - Rua Infante d'Henrique - Railway Station - Parque de Feiras e Expo* -Hospital - Cardosas - Centro do Saúde - City (Largo do Dique) every 45 minutes. Quicker than route 31 for journeys to or from Railway Station and Hospital. Route 34 - Campanheira - Hospital - Cardosas - Retail Center - Centro do Saúde - Bemposta eight journeys at irregular intervals. Not shown on the map! Route 36 - Poeta Ant.Meixo School - City (Rua das Hortas) - Retail Center - Chão das Donas - Alfarrobeiras. Every 30 minutes except that Alfarrobeiras is served only once each hour. Route 16 - same as route 13 above but extended to also serve Montes de Alvor near the aerodrome. Four buses Portimão to Alvor, five buses Montes do Alvor via Alvor to Portimão. Service finishes at 1725hrs. Runs only on Saturdays. Route 37 - Hospital - Cardosas - Centro de Saúde - City (Largo do Dique) - Railway station - Parque de Feiras e Expo* - Hospital. Every 60 minutes. On Saturdays some buses run to and from Ladeira do Vau. Route 38 - City (Largo do Dique) - Rua das Hortas - Sesmarias - Chão das Donas - Alfarrobeiras. Saturdays only. Two outbound and three inbound buses only. Route 39 - City (Largo do Dique) - Bairro Independente / Estadio 2 Irmãos - City (Largo do Dique). Saturdays only, seven buses at irregular intervals. The current official fares leaflet can be downloaded here - available in Portuguese and English. Fares have not increased since 2013! There is a flat fare on Vai e Vem buses. Cash fare is €1,50 for a single journey. A one day ticket (unlimited journeys) is 3,50 Euros; buy that from the driver. There is no discount for seniors or children except for residents. Children under 4 travel free. Pre-paid single journey tickets are 80 cents. 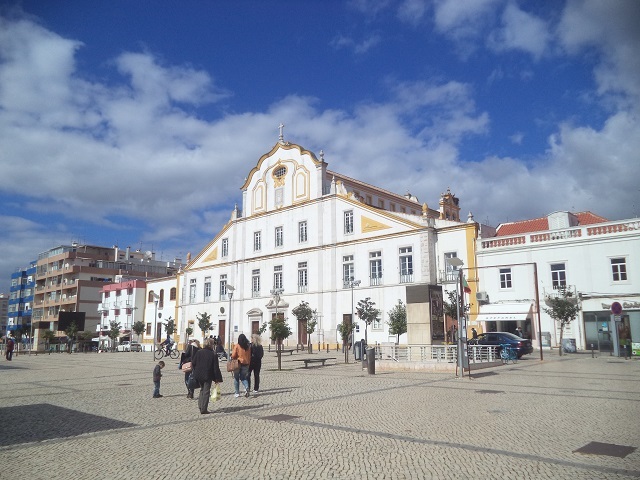 10 or 20 journeys can be loaded onto a rechargeable card, costing 3 Euros, which you can buy at the Largo do Dique bus office and other places around town, including in Alvor: Papelaria El Rei, Rua Marquês de Pombal, nº 3. This pre-pay system will save you money if you intend to use the buses more than about 6 times during your stay. Children under 4 years old travel free. Monthly passes are also available at €24.00 and you need a photo. Enquire at the bus office. Children, senior citizens and those of reduced mobility who are residents can get half price passes, but you will need to provide proof of address etc. Tourists are not eligible for these discounts. Vai e Vem tickets are not valid on EVA or Frota Azul buses, nor vice-versa. Portimão's old 'bus station' used by local and regional buses is an open air facility near the Largo de Dique, which is not far from the old bridge over the river and the main city centre shopping area. ALL INTERURBAN BUSES LEAVE FROM THE AVENIDA GUANARÉ NEAR THE REPSOL GARAGE. MOST VAI E VEM LOCAL BUSES USE THE STOPS AT LARGO DO DIQUE. CLICK THE MAP BELOW FOR LARGER SIZE. NB - bus stops are not lettered as per map - this is just for convenient indexing! Check which stop your bus leaves from. Do not leave it to the last minute! (Personal experience was not a good one!). The bus stops are fairly clearly labelled as to the destinations served. There is a bus ticket and enquiry office but no waiting area. There is small shop and café attached to the Repsol Garage (petrol station). Inbound local buses from Lagoa and Ferragudo don't turn immediately towards the Largo do Dique. They go along the Rua Infante de Henrique as shown, before embarking on a tour around the city. If it's the city centre shops you want, get off at the first stop after crossing the bridge. EVA, REDE-EXPRESSOS AND RENEX LONG DISTANCE SERVICES NOW CALL AT THE NEW BUS STATION 1.5km (nearly a mile) from the town centre. CLICK FOR MAP. a limited service of shuttle buses runs between this area and the new bus station - times here. Local routes 31, 32 (weekdays) also 37 (weekends and holidays) stop at the new bus station. It is not known at this time when or if other local routes will be adjusted. Portimão railway station is a few minutes walk to the north of the city centre. Routes 31 and 32 stop there on weekdays, at weekends the 37. Portimão has several retail parks and shopping centres around the edges of the city. Most of the buses mentioned below DO NOT run at weekends. Aqua Shopping is served on weekdays by routes 31, 32, 34 and 36, at weekends by route 37. The Cardosas stop on other routes is within 3 minutes walk. It is 6 or 7 minutes walk from the railway station, 12 - 15 minutes from the main bus stops above. The Monchique to Portimão bus also stops at Cardosas. Portimão Retail Centre , the nearby Vila Marché shopping centre and the big new Continente hypermarket are also served by routes 31,32, 34, 36 and 37 as well the inter-urban bus (no route number) from Lagos via Mexilhoeira Grande. The Center Comercial Continente on Rua São Lourenço de Barrosa is served only by route 36.